A year ago, we had denounced on this same site the ongoing scandal at the chateau de Fontainebleau where the Chief Architect for Monuments Historiques (ACMH), Jacques Moulin, “was restoring” in his own manner the Quartier Henri IV, notably by entirely covering up the sandstone facades with yellow paint (ill. 1). Not only was this not the original shade (the sandstone was not painted) but, as we demonstrated, this choice had never been validated by a decision. 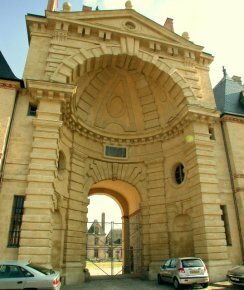 This architect has now been relieved of his charge at the chateau de Fontainebleau. We cannot sincerely deplore the fact as this was not his first misstep. Let us take only one example, which we were not able to visit at the time it reopened to the public : the chateau of Blandy-les-Tours (Seine-et-Marne). This building of the 13th and 14th centuries had been dismantled early in the 18th century, that is almost 300 years ago. Most of it survived in the form of Romantic ruins until a few years ago (ill. 2). The Conseil general de Seine-et-Marne, the owner of this chateau listed as a Monument Historique decided to restore it, and entrusted Jacques Moulin to carry it out which he did with his usual zeal. Our readers can easily judge the end result from these photographs. 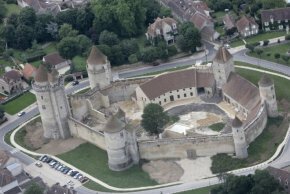 The Conseil general has stated that this is the most beautiful 14th century chateau in the Ile-de-France region. There is no doubt, in any case, that it is certainly the newest. 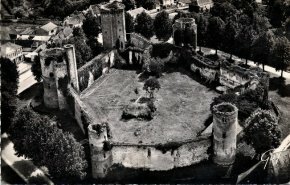 The chateau of Blandy-les-Tours has undergone a veritable reconstruction. It of course needed to be restored, consolidated, and rid of the overgrown vegetation which was threatening the building but that would not have been spectacular enough, expensive enough or reusable enough. It has thus been transformed into an imaginary chateau, with both tower cappings and elevations erected inside the walls which are not documented (ill. 3). Although the final result is pleasant to the eye and amuses visiting children (at least as concerns the exterior), the building no longer retains anything really authentic. Supporters will obviously retort by citing Viollet-le-Duc as an example. But he set his stamp on a period when the idea of restoration was very different from the one which prevails today. Viollet-le-Duc is now part of history and should be respected for that , and for his genius. Photo : All rights reserved. We are therefore happy for Fontainebleau and commend its director, Bernard Notari, whom we had nonetheless criticized when he was appointed. Thanks to his initiative, by virtue of a recent law enabling owners of listed Monuments Historiques, both public and private, to enlist the chief architect of their choice , that Jacques Moulin will no longer fill that position at the chateau. Bernard Notari, whom we were able to reach on the phone told us he : “was looking for a chief architect of Monuments Historiques to work with the project manager and contractor”. He did not comment on Jacques Moulin’s dismissal. The Ministry of Culture also chose not to make any further statement. Let us hope that this will instill caution in anyone who would continue to confuse restoring and building. A Monument Historique should be treated humbly. Certain practices should cease. Obviously, responsibility often lies with more than one person and is not only the architect’s fault. Project managers also have a fundamental role to play, on condition that they have the required competence to do so and that they communicate with the contractors. The administration of the Monuments Historiques and the ACMH should, in last instance, remain the guarantors of fair practices, not promoters of mistaken ones. With the exception for the moment of public establishments in charge of monuments belonging to the State, as Jean-Jacques Aillagon , president of domain of Versailles, regretted in his interview. Let us point out that for the Quartier Henri IV, the project manager was not the chateau but the DRAC Ile-de-France, the EMOC (Etablissement public de Maitrise d’Ouvrage des travaux Culturels) being deputy project manager.